Driving from Bolesławiec down the road no 363 towards Złotoryja you cross Warta Bolesławiecka. 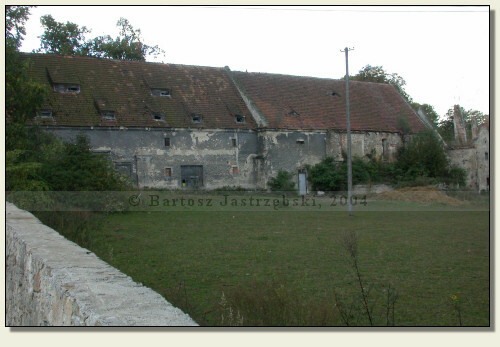 There you ought to turn right to Wartowice and after traveling around 400 m, there is a private farmstead on the right side. 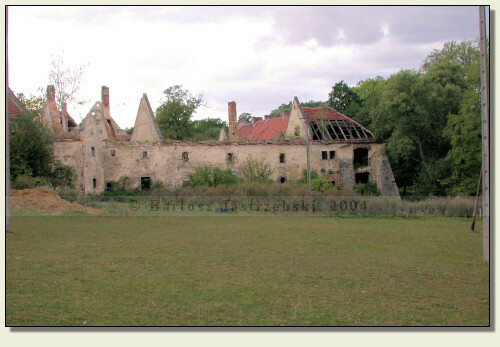 On its grounds there are situated the ruins of the castle and manor. The castle in Warta Bolesławiecka arose at the end of the XIVth cent. so as to become the property of knight Burgold von Stibitz at the beginning of the XVth cent. The next owner of the castle was knight Stewitz who took delight in mugging. Subsequently the castle changed its hands again. The significance of the stronghold diminished considerably since 1540 when a renaissance manor was raised beside the castle. Its constructor was Hans von Zedlitz. In the next centuries the manor was often converted, and the works from the turn of the XIXth and XXth cent. utterly obliterated an incipient appearance of the castle. Portions of circular wall have preserved of the castle until today, and of the manor – a ruin of the building.